We’ve made it easier for you to sell gift cards! 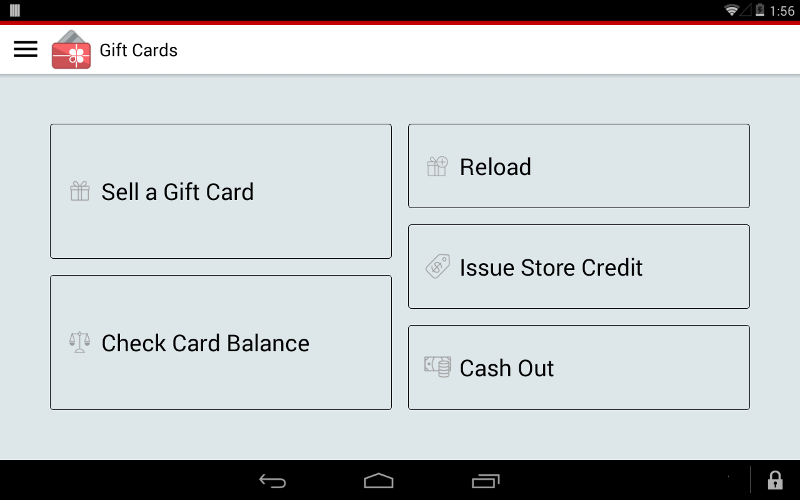 No matter what type of business you run, you can use the Register app on your Clover device to sell a gift card, rather than having to toggle back and forth between apps. 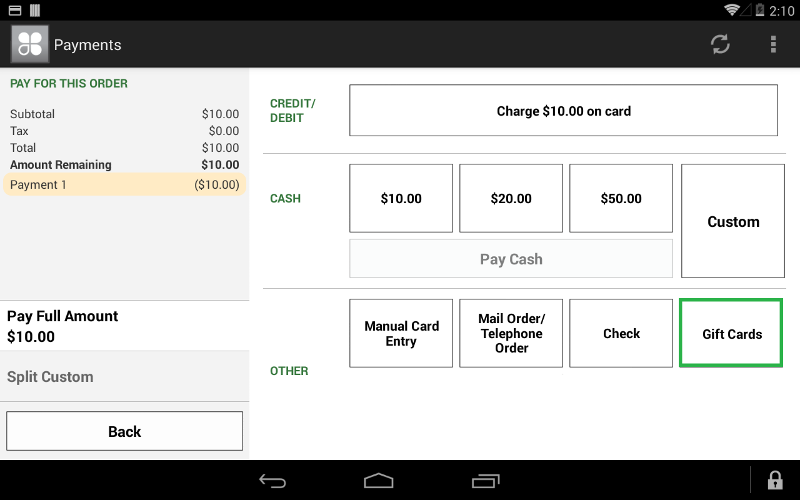 Employees will see ‘Gift Cards’ as a selectable item to add to an order. We’ve created over 70 pre-designed gift card templates along with new fonts and font colors for our Standard package! We now offer solid colors, patterns, birthday, business, thank you, wedding, and holiday designs. With many of the templates you will be able to customize the front of the gift card with your business name, and edit up to three lines of text on the back in minutes! To get started, log in to your Clover.com account here. Want to have custom designed gift cards for your business, but don’t have time or the software programs? Hire a designer to create your perfect gift card! Work with our experienced gift card designers to create a completely customized gift card for your business. 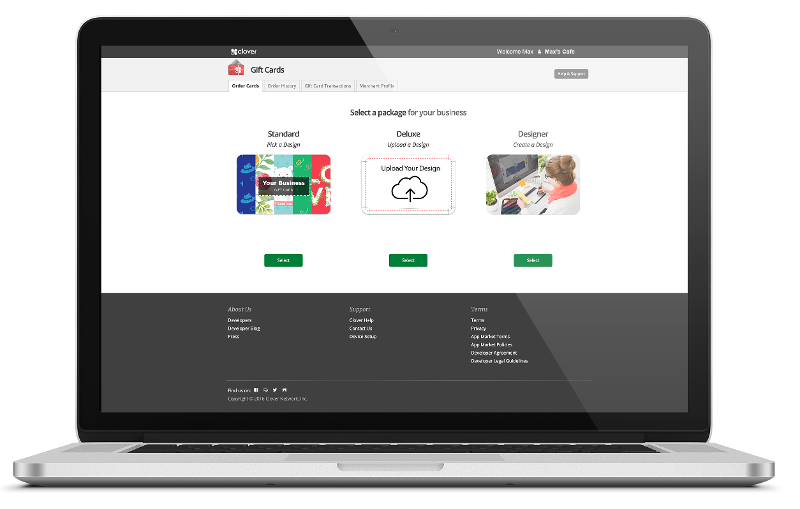 To get started, go to the Gift Cards app on your Clover.com account and select the Hire-a-Designer package on the “Order Cards” tab. To begin working with a designer, log in to your Clover.com account here. Our Deluxe design file upload feature now accepts PDF, JPG, EPS, and PNG files. This improvement makes it easy to upload any type of file you’d like. Please note, the files will still need to meet our gift card art guidelines. If your art does not meet the guidelines, or you need help creating a gift card design, check out our Hire-a-Designer package. 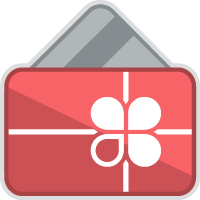 To upload your gift card artwork, log in to your Clover.com account here. Track your gift card transactions and outstanding liability. From the ‘Transaction’ tab, you can now search by date for all of your gift card transactions and export them to a .csv file. In addition, we have added your business’ liability report. This report reflects your business’ outstanding gift card balance. Get number crunching by logging in to your Clover.com account here. Check gift card balances instantly Ordering fully custom plastic gift cards is easy! Just log in to www.clover.com and open the Gift Cards app. Our easy to use app allows you to order gift cards in minutes, without the need to call or email a sales rep. You can choose from over 70 standard designs, upload your own custom design or work with a designer to create your gift cards! Have an existing gift card program? No problem! You can easily convert an existing gift card programs to Clover Gift Cards.